The nymph-like Audrey Hepburn has long brought joy to my life, being especially fond of Sabrina. Why Sabrina? Probably because I have this ridiculous, unexplained thing for France and hopes of one day floating off for an extended stay, only to return worldly and sophisticated. Sabrina writes home to her doting, chauffeur father with Le Vie en Rose playing like a dream in the background. Le Vie en Rose just so happens to be a favorite song of mine, easily in my top ten, so when a movie came out about the singer's life, I immediately saw it. I was thus introduced to Marion Cotillard via her haunting performance of Edith Piaf's unfortunate existence. Stunning. I've been nursing quite the girl-crush on her since, which led me to silly things like spending Christmas Day with my mom in the theater watching Nine or picking up the July issue of Vogue last night. While reading the feature article, I decided we were kindred spirits for three reasons: one) she keeps Polaroid film in her fridge, and I respect anyone with nonfood items in their fridge; two) she has a large hat collection, and so do I (my vintage darlings); and three) she offhandedly mentioned a love for artist Alberto Giacometti. Shut your mouth, Marion Cotillard! 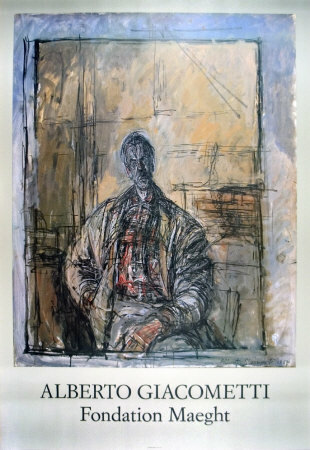 I adore Giacometti! He is my favorite, favorite, favorite, though not for his sculptures, but his paintings. The poster pictured above, Diego a La Chemise Ecossaise, is hanging in my apartment, and while some find it startling and possibly unsettling in a bedroom setting, I often get lost in it for lengthy bouts of time. What does this all mean? Absolutely nothing, but I wanted to share.